Vintage after vintages, this vineyard shows its potential to produce intense rich style of Riesling. It is rarely completely dry, but has enough acidity and structure so it would last long enough to digest its power and hide behind a very aromatic intense style of wine. The Riesling is planted on the steepest part of the Heimbourg, the one which is exposed to the South to Southwest. Heimbourg is only about 9ha big, but there are 3 distinctive parts and each one of them is better expressed with a different grape variety. The Marl Calcareous soil is capable to retain lots of structure in the grapes. The sun-drenched exposition and the precocious Turckheim climate allow for lots of ripeness and more sugar content in the grapes. Heimbourg and Brand are very often the sweetest Riesling wines of the estate. This was actually the fastest to ferment and therefore bottled already in September 2009. 2/2010: intense fruity Riesling nose, partially balanced with some leaner limestone influence. It already has 6 months in the bottles, so is clearly ahead of the pack in its aromatic expression, which will continue to grow in the future. 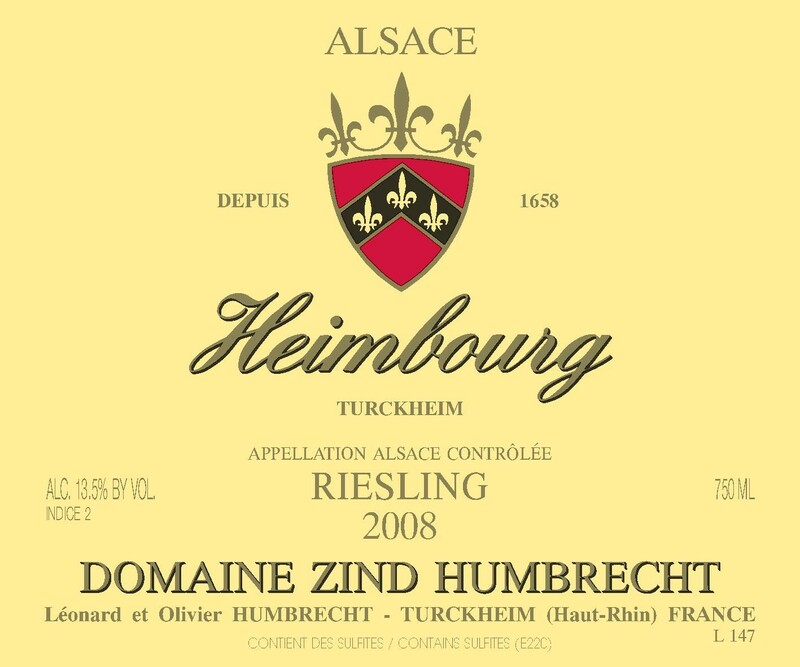 The palate is generous, but doesn’t feel rich, because Heimbourg always has great acidity. The sweetness level could almost justify an indice 3 rating, but not with such clean crisp acidity on the finish. The calcareous vineyard really comes alive on the finish as the wine narrows to a mineral bundle.